The professional staff at Luscutoff, Lendormy & Associates plays a key part in each of the practice areas at our San Francisco law firm. Our staff is experienced and well trained. Most have University degrees. They bring to the firm a broad range of experiences that translates into a sensitivity to client needs. They have the training and the talent to actively assist our attorneys with the complexities of litigation procedures, court trials, jury trials and probate proceedings and the nuances of immigration and visa regulations. 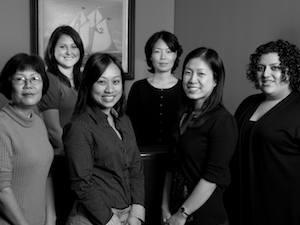 Staff members are cross-trained in several practice areas. Training and education is ongoing. Every week all staff members attend a formal training session where they receive updates on new developments in legal procedures and where they re-review current practices. Our law firm’s professional staff received their college and post graduate educations at the University of San Francisco, the University of California at Berkeley, Sonoma State University, University of California at Santa Cruz and in Korea and China. Among them, they have prior experience in the fields of banking, immigration law, family law and the Peace Corps. To facilitate the work of our attorneys practicing in business law, real estate law, estate planning and immigration, two of our staff members are regularly licensed, bonded and insured as California public notaries. In Mexico the ‘notario publico’ must first be a licensed lawyer and after that receives training as a notary. In France, the “notaire” is appointed by the Ministry of Justice. French notaires are authorized to act like title officers and to provide certain types of (legal) advice in connection with real estate contracts and transactions. In the United States and California, the notary public is none of those things. In California a notary public is a ministerial officer only and has no right to exercise a judicial function or to give legal advice. This is often confusing to persons from other countries where the function of a notary may be quite different. In California, “notarization” is a three-part process of vetting, certifying and record-keeping, i.e. of the notary’s notarial acts. The central value of notarization lies in the Notary’s impartial screening of a signer for identity. This screening helps deter document fraud; and, in that sense, helps guard against forgery and identity theft. Notarization is a sign that a signature is genuine; but it does not guarantee much beyond that. Although California has some of its own limits and special provisions on the acts of notaries, across the United States there are three major kinds of notarial acts — “acknowledgments”, “jurats” and copy certifications. In the case of an “acknowledgment”, the signer must appear in person at the time of notarization to be positively identified and to declare (“acknowledge”) that the signature on the document is his or her own. The “jurat” is typically performed in connection with documents used in the civil and criminal justice system. For example, such documents include affidavits, depositions and interrogatories. For a jurat, the signer must appear and sign the document in person at the time of notarization and speak aloud an oath or affirmation to the effect that the statements in the document are true. In some states, but not including California, notaries also perform comparisons of original and copied documents. The notary then notarizes copy certifications to confirm that a reproduction of an original document is true, exact and complete. This copy certification function of a notary is state-specific. In those states where it is authorized, often it is confined to certain specific types of documents.